Back by popular demand, the classic JPS holiday anthologies remain essential and relevant in our digital age. Unequaled in-depth compilations of classic and contemporary writings, they have long guided rabbis, cantors, educators, and other readers seeking the origins, meanings, and varied celebrations of the Jewish festivals. 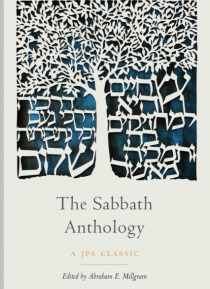 The Sabbath Anthology delves into one of the earliest Jewish institution… s—the holiday the prophet Isaiah characterized as “the day of delight”—elucidating its history, laws, customs and traditions, religious and ethical insights, and observances in different eras throughout the world. A wealth of Jewish creativity past and present—“The Sabbath in Judeo-Hellenistic Literature” by Flavius Josephus and Philo Judaeus; Talmud and midrashim; medieval Jewish literature by Judah Halevi, Abraham ibn Ezra, and Moses Maimonides; modern Jewish literature by Solomon Schechter, Mordecai Kaplan, Sholom Asch, Hayyim Nahman Bialik, and Ahad Ha’am; short stories by S. Y. Agnon, I. L. Peretz, Meyer Levin, and Martin Buber; ceremonial and decorative art; musical compilations and programming—will yield delight for many Sabbaths to come.